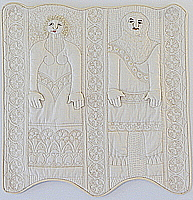 Elizabeth (Betty) Gurrier was a pioneering textile artist who is best known for her whimsical, intricately stitched whitework quilts and soft sculptures. 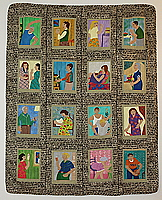 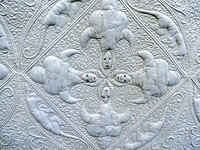 She participated in many of the seminal exhibitions of non-traditional quilts in the 1970s, where her sculptural whitework and complex machine quilting astonished viewers and fellow artists alike. 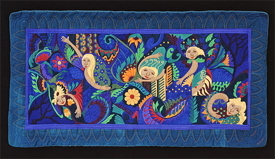 Her work has been exhibited internationally at museums and galleries and is included in the collections of the Renwick Gallery of the American Museum of Art/Smithsonian Institution, the North Carolina Museum of Art, and the International Quilt Study Center & Museum. 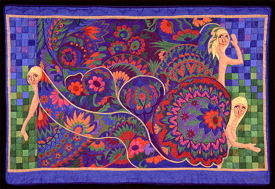 Gurrier received a B. 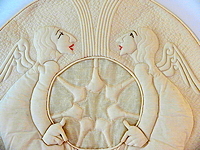 A. in Art History at Wilson College in Chambersburg, Pennsylvania, after which she spent two years in the New York City business world, taking evening courses in copper enameling, ceramics and silk screening. 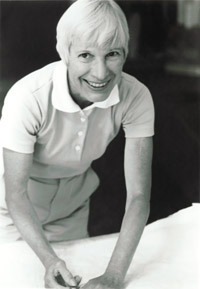 After marrying Bob Gurrier, her husband of fifty-six years, they moved to West Hartford, CT and raised three children. 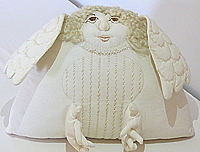 She also did graduate work in education at St. Joseph's College in West Hartford; continued courses in design, figure study, and sculpture at the University of Hartford; and exhibited sculpture in juried shows and galleries in Connecticut. 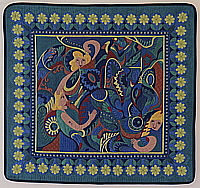 Before moving to New Hampshire, however, a stitchery seminar sent her in a new direction, and she ultimately abandoned her career as a sculptor in favor of creating soft sculpture figures, wall hangings, and quilts. 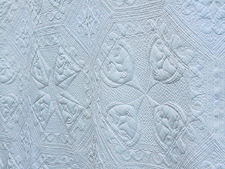 After several years of working with colored fabrics, she began imposing a new discipline--that of designing strictly with off-white fabrics, primarily unbleached muslin. 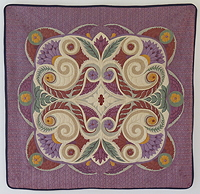 Only the softest and most subtle touches of color were introduced in her stitchery. 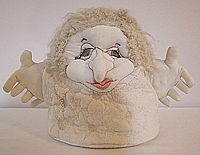 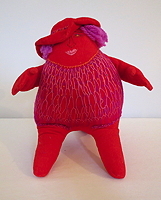 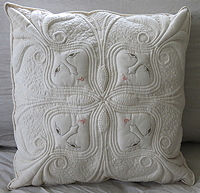 She used both hand and machine stitchery, along with quilting, trapunto and stuffing. 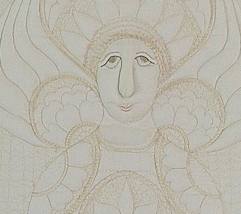 The intention was to create light and shade as a “hard” sculptor would do. 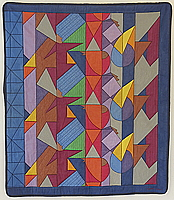 Without the emotional impact of color, the essence of the design became the interplay between texture and form. 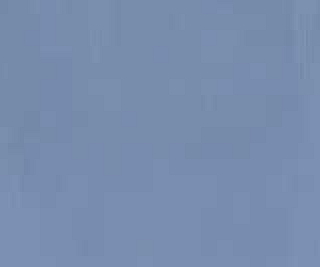 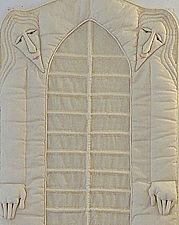 “Without color and the emotional response it brings, the design itself must do the communicating,” Gurrier explained. 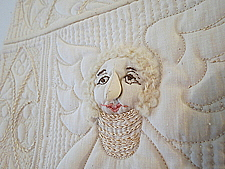 She usually machine stitched and quilted her work, whether a wall hanging, bed covering,soft sculpture figure, or handbag, but the comical faces—a common element in her creations—were always hand-stitched without a pattern. 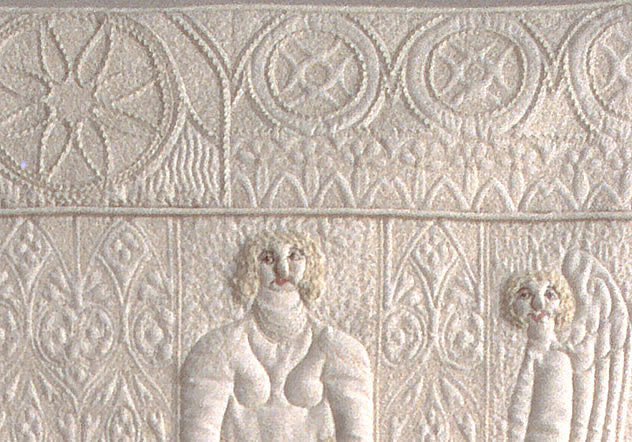 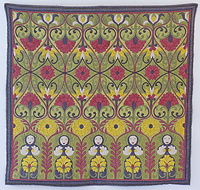 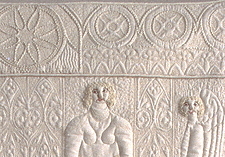 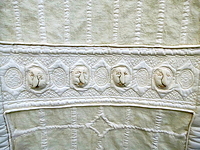 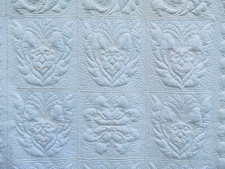 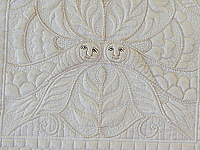 Michael James, who featured examples of Gurrier's whitework in his books The Quiltmaker's Handbook and The Second Quiltmaker's Handbook, described it as pushing "stuffed work to its limit as soft sculpture," and added: "Historically, rich detail and exquisite workmanship were hallmarks of the all-white quilt. 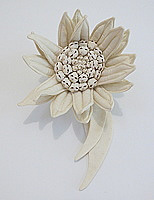 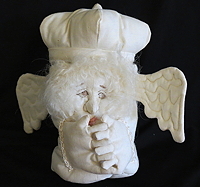 Elizabeth Gurrier carries on this tradition in [her] innovative pieces." 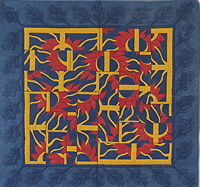 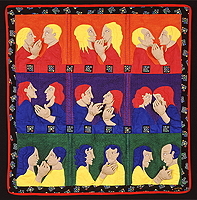 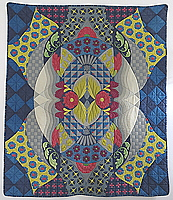 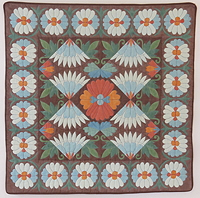 In the late 1980s, Gurrier moved in still another new direction, designing one-of-a-kind hand painted quilts. 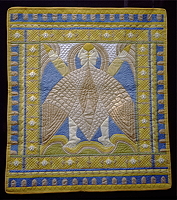 Like her whitework, these were made of wholecloth muslin, which she painted with textile pigments, adding hand and machine quilting and often embroidery and stuffed work as well. 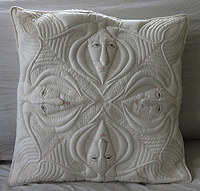 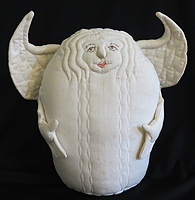 While her painted work is far less well known than her whitework, it is equally inventive and remarkable, as are the many soft sculpture figures, pillows, boxes, handbags, and other forms she made during her long artistic career.